Alert people that pets are inside your home in the event of an emergency! Help keep your pets safe with a free pet safety pack from the ASPCA! In the event of an emergency, our pet rescue window decal alerts rescue personnel that pets are inside your home. 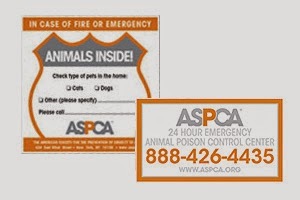 The safety pack also includes an ASPCA Animal Poison Control Center magnet—a great way to keep the APCC's toll-free emergency number and website address handy in case your pets get into something they shouldn't! You should receive your free Pet Safety Pack in six to eight weeks. Requested this for my little dog, Buddy - Oct 21/08. I can't imagine losing him in a fire!